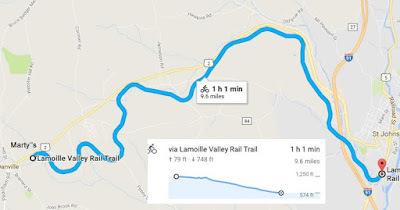 Crappy overcast and rainy weather but with a forecast for a clearer afternoon made me get started late and detour up to Morrisville to check on any remaining railroad vestiges before I ventured east to ride the rail trail. 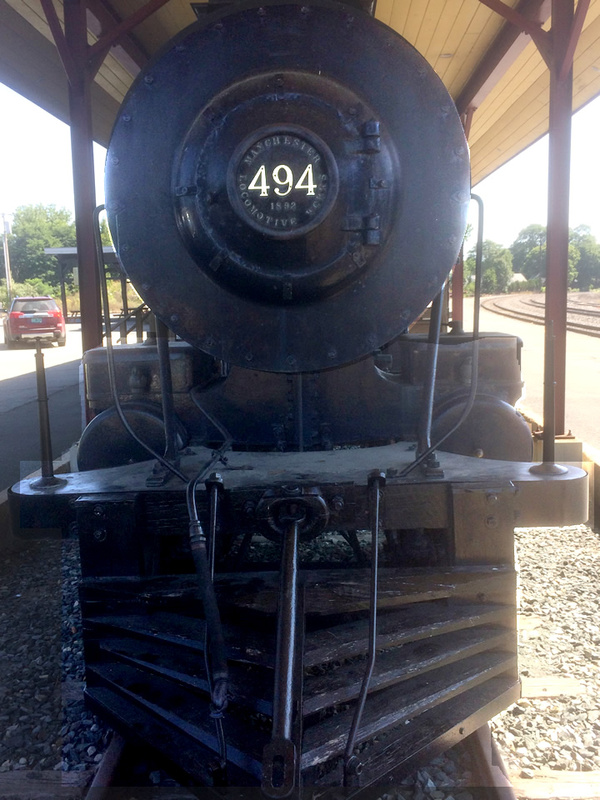 The Morrisville Train Station has been wonderfully restored as a coffee shop and also serves as a trailhead for the rail trail northward. Looks like a pretty serious BBQ! I stopped at West Danville to start my rail trail ride but it started to rain so I ducked onto this quaint spot: a post office and a general store - where I had a homemade beef stew while wanting for the rain to subside. Still looking lousy outside, I decided to drive to Danville and start my trek there but first…. 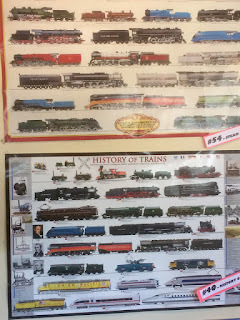 I checked out the train station! 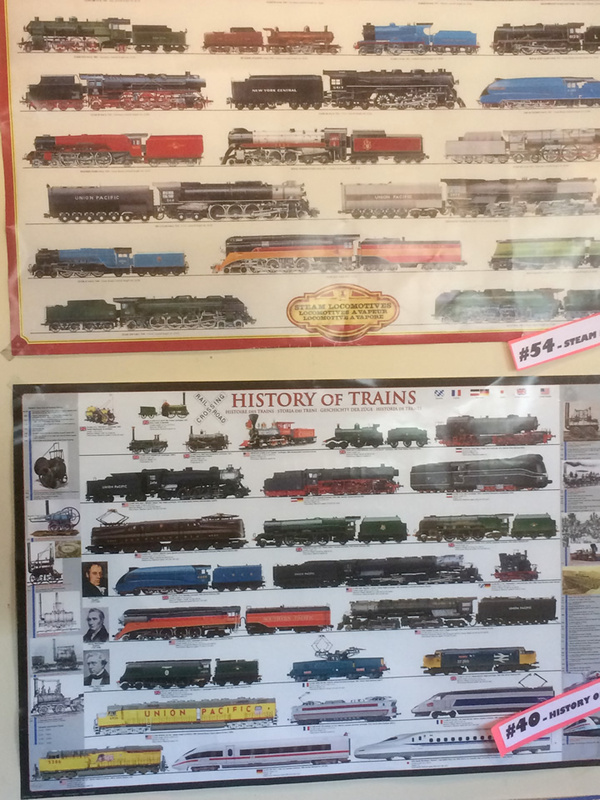 I started my ride at Marty’s. The sky look ominous but the rain never returned! 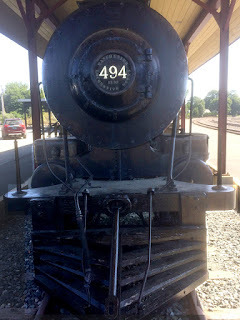 Once riding, I did notice this tie plate but otherwise there were very few remnants of the railroading days present. 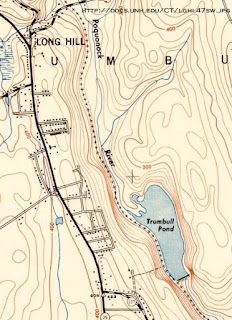 There are quite a few rock cuts on this section of the rail trail (I really enjoy the sensation of riding thru a rail cut). I have made a brief "one-handed" video of some of the highlights of ride- ENJOY! On my return back up to Danville, I noticed this pile of ties off to the side. The trail ends in this nondescript site so I just turned around and rode straight back (but going up the entire way took a little longer). 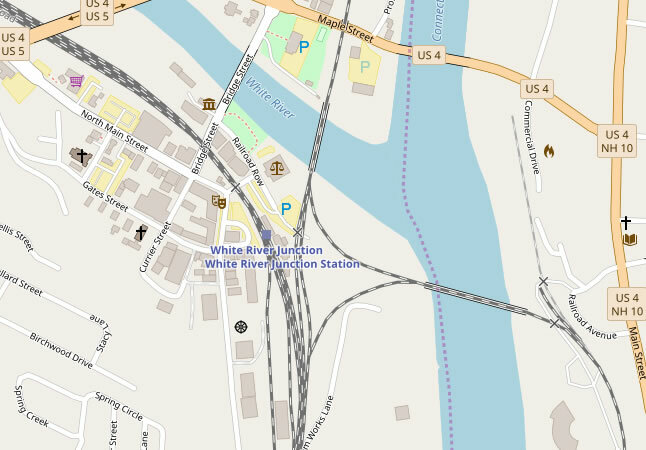 After my ride, I drove down to St. Johnsbury and visited the railroad station. 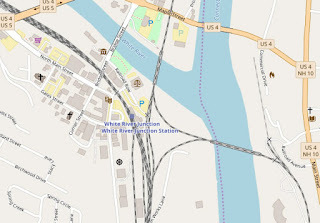 It is now a welcome center and museum. This was marvelous - see the B&M design etched in the leather? St. Johnsbury & Lamoille County, "The Bridge Road"
^ This is a great Video! It was a beautiful day -- sunny but not too hot with a breeze. 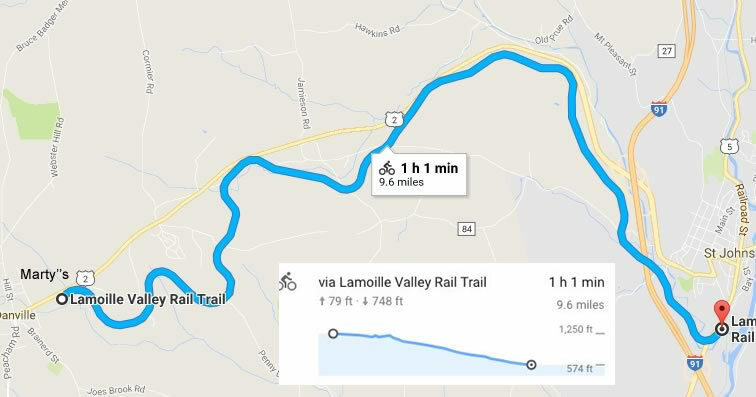 After my mountain bike ride in the valley, I decided to revisit the rail trail -- it was just too nice outside to head home! IMHO the stretch between Whitney and Tait has got to be one of the most scenic rides in the state! The lush canopy of greenery kept the ride cool and pleasant. 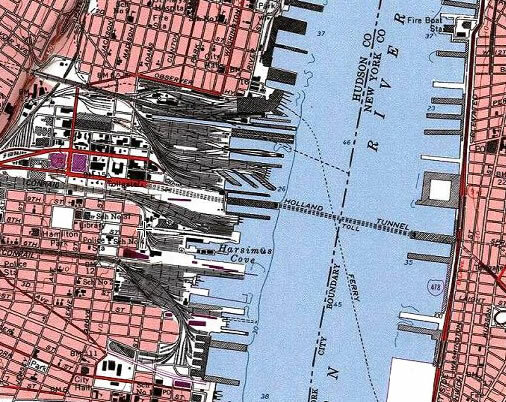 A walk along the riverfront and an eye-opening visit to the Hoboken Railroad Terminal back in October 2016 (see previous post) piqued a deep-seated curiosity to dig up more details about the history of the docks in this area. Its really a fascinating story and probably little known to the thousands of folks who work or live in this modern immaculate corporate enclave. 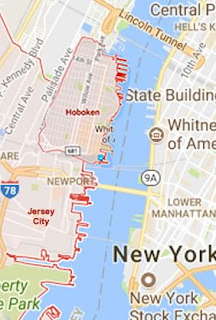 Of course a first glance backwards will take you to Frank Sinatra (Hoboken was his birthplace) and Marlon Brando (Elia Kazan’s award-winning film: “On the Waterfront”) but that’s just the tip of the iceberg. 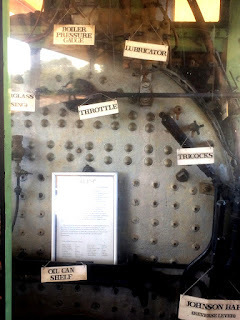 If you turn back the clock a bit further, you will uncover a terrible maritime tragedy and an innovation in tunnel ventilation--both significant historical milestones especially considering their impact on safety standards across the globe. 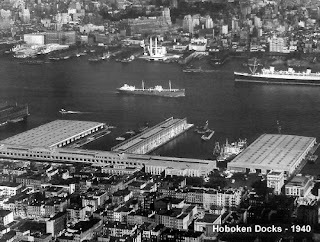 The photos below will take you on a brief “then and now” tour focusing on the docks. 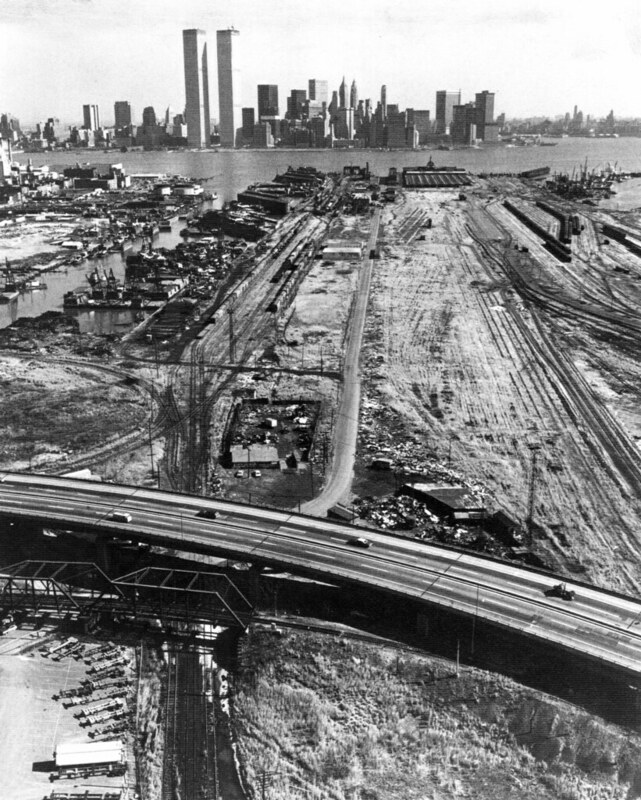 This stark contrast is mirrored in many other similar places across the globe as technology and transporation changes evolved over time. 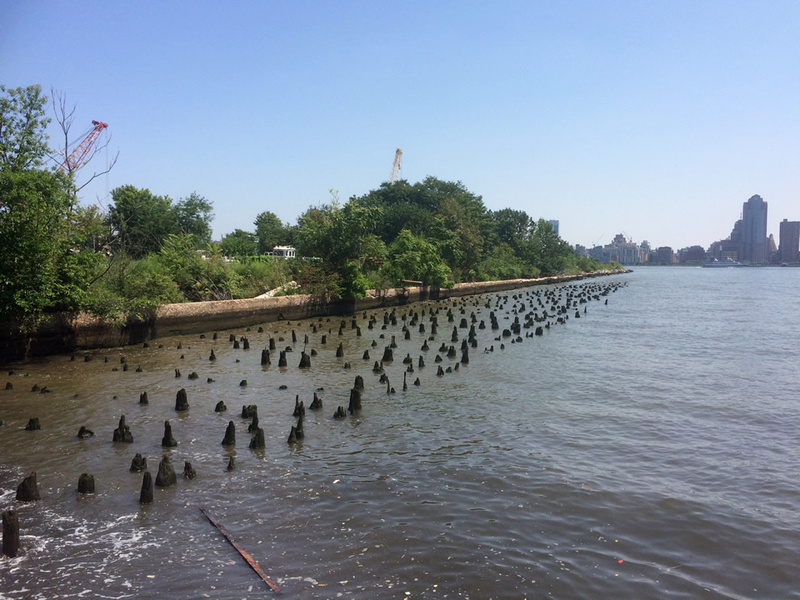 The still-standing eroded remnants of these piers are ghostly reminders of a far different hustle and bustle of a not so distant past. 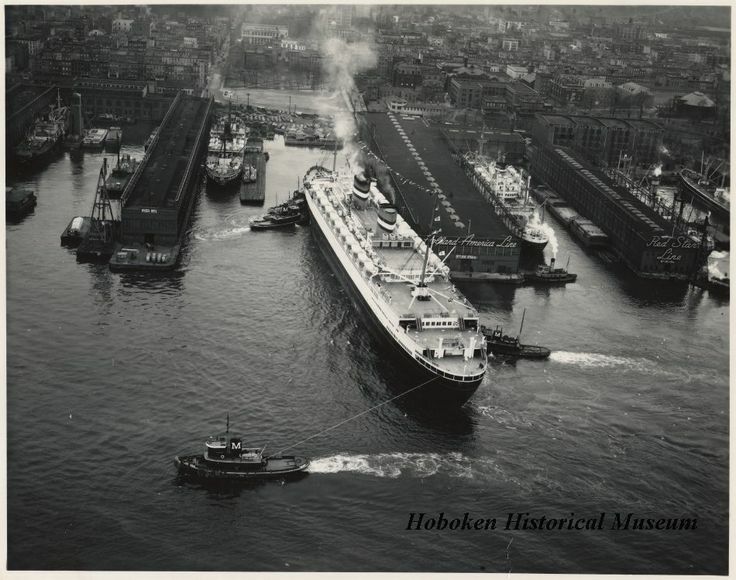 At the turn of the 19th and 20th centuries, Hoboken was the seat of a vast shipping and industrial complex. 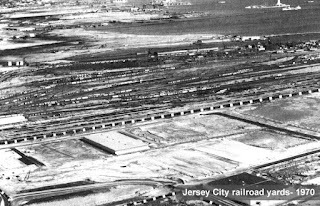 Huge docks and warehouses lined the shore and quite a few large railroad yards engulfed the area. 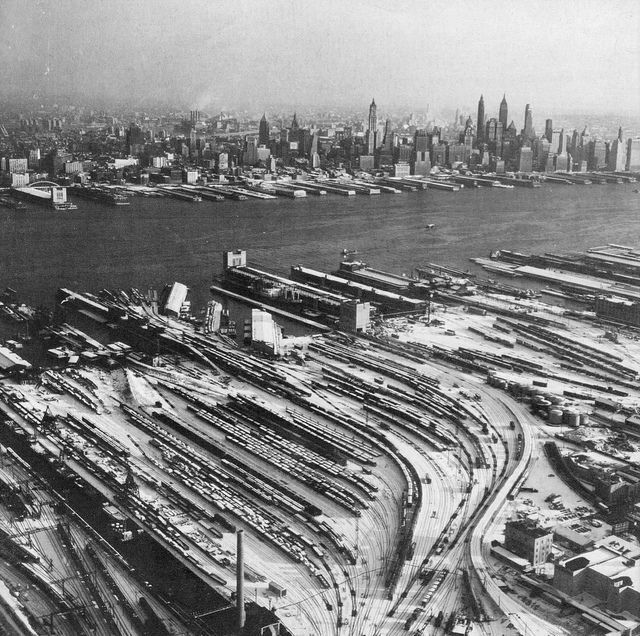 Many major railroads reaching westward terminated at Hoboken and the amount of freight shipped through these docks was enormous. 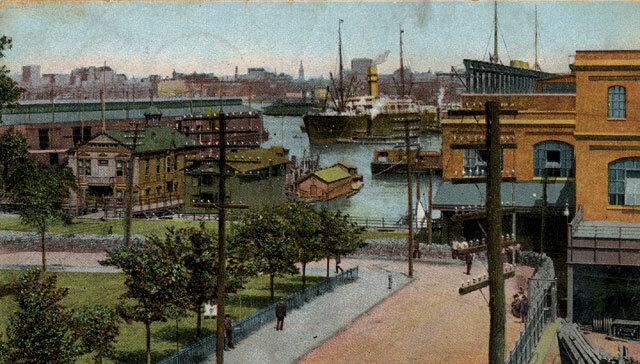 Shipbuildng was also major industry here so the waterfront was a bustling hub of economic activity. 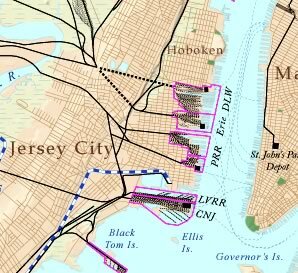 The 1900 Hoboken Docks fire occurred on June 30, 1900, and killed at least 326 persons. 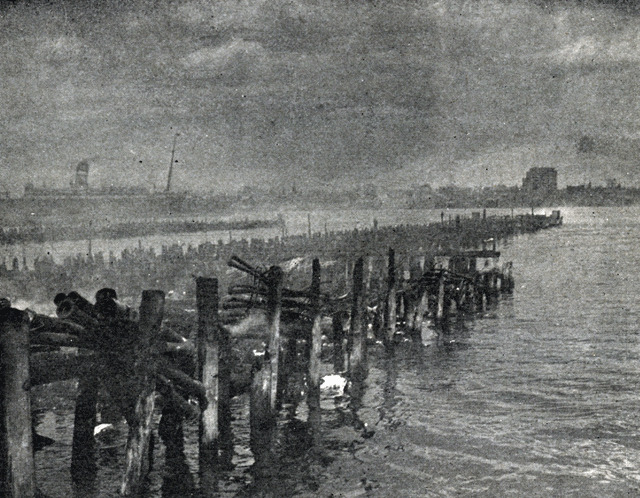 The fire began when cotton bales stored on NDL’s (Norddeutscher Lloyd) outermost wharf caught fire, and winds carried the flames to nearby barrels of turpentine and oil, which exploded in rapid succession. 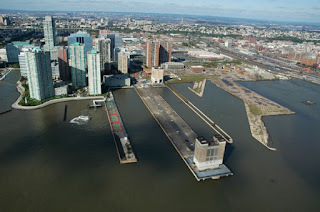 It burned NDL’s Hoboken piers to the waterline, consumed or gutted nearby warehouses, gutted three of NDL’s major transatlantic liners, and damaged or destroyed nearly 24 smaller craft. 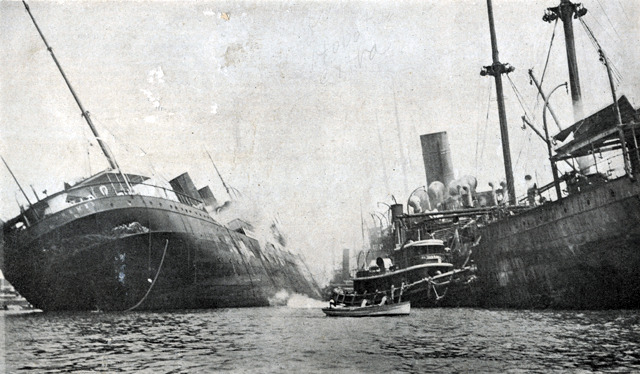 Many of the deaths occurred as the flames reached several of NDL’s transatlantic steamships docked at the piers. 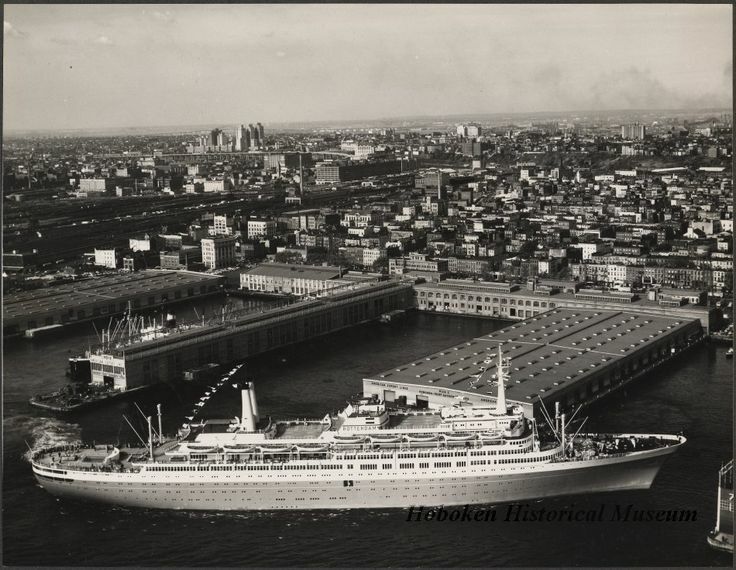 Three of these ocean liners became deathtraps for dozens of seamen and visitors who were unable to reach safety on deck or to squeeze through portholes to escape. News stories of the fire had described below-deck crew “trying in vain to force their way through the small portholes, while the flames pressed relentlessly upon them.” The fire prompted arguments that portholes on all ships should be larger in size and eventually regulations required portholes to be big enough for a person of reasonable size to escape. 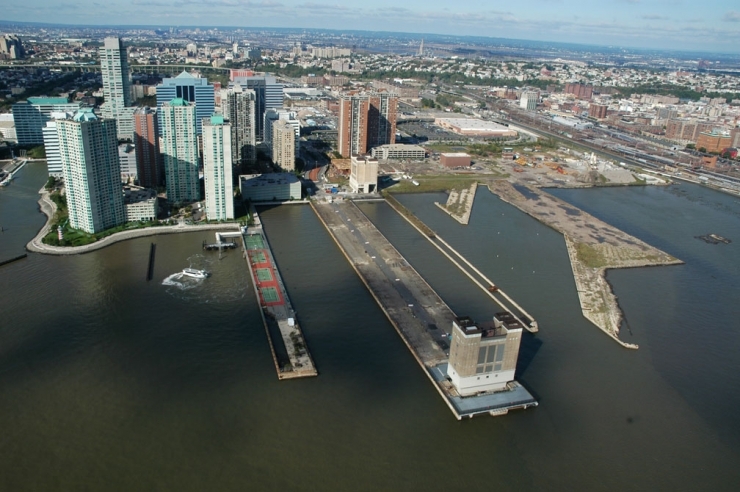 Begun in 1920 and completed in 1927, the Holland tunnel was the first mechanically ventilated underwater vehicular tunnel in the world. 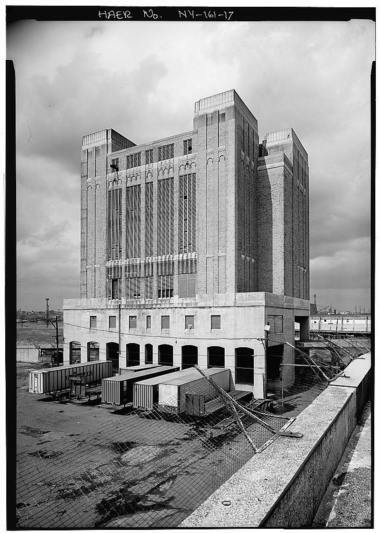 The eighty-four fans, in four ventilation buildings can completely change the air inside the tunnel every 90 seconds. A forced ventilation system was essential because of the poisonous carbon monoxide component of automobile exhaust. 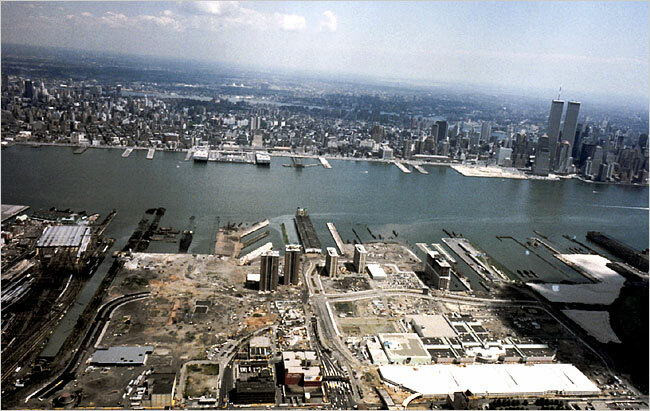 Holland Tunnel ventilation buildings in Jersey City/Newport -1988. 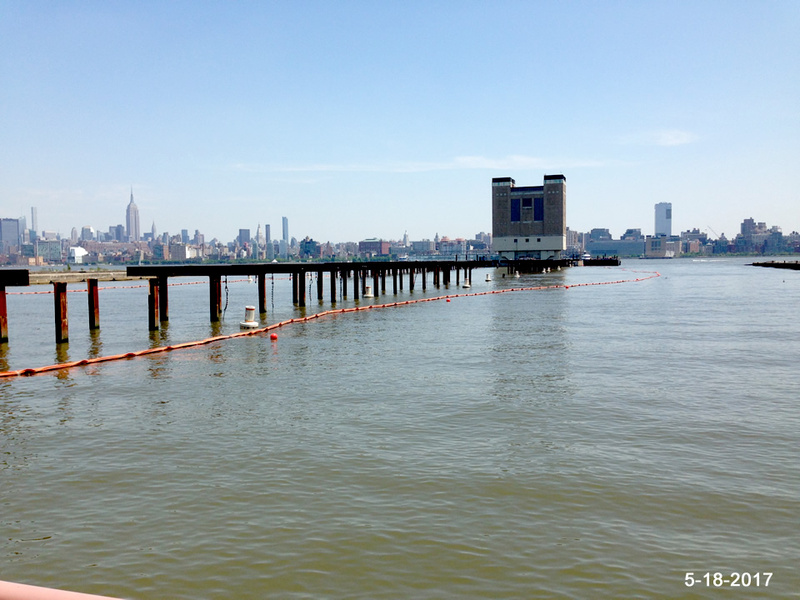 The pier that stretched out to the ventilation tower is slowly being dismantled. 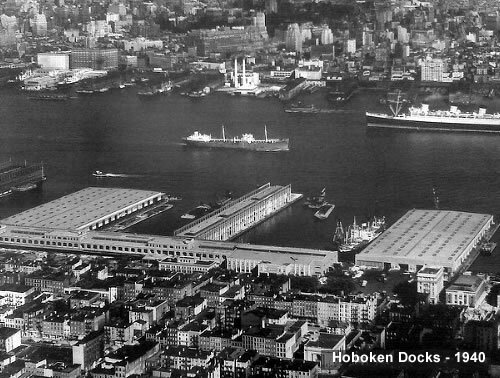 World War II facilitated economic growth in Hoboken, as the many industries located in the city were crucial to the war effort. 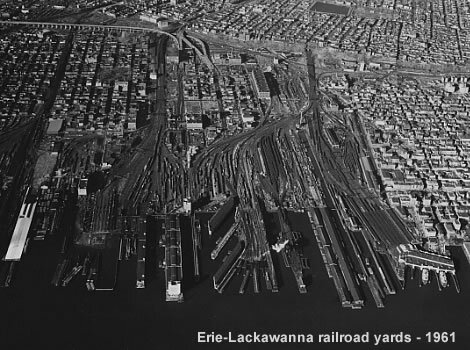 Even during the 1950s, the economy was still driven by Hoboken-based big industries... Unions were powerful and the pay was good. 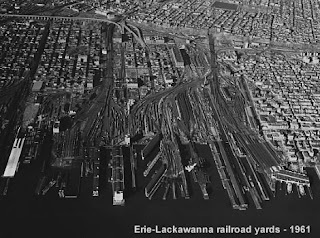 By the early 60s, the development of containerized cargo--necessitating deep water ports--and due to interstate highways, the switch to trucking--had increasingly undermined the Hoboken waterfront. Many of Hoboken's industries moved away during this time and the city was considered something of a post-industrial wasteland until the 1970s. 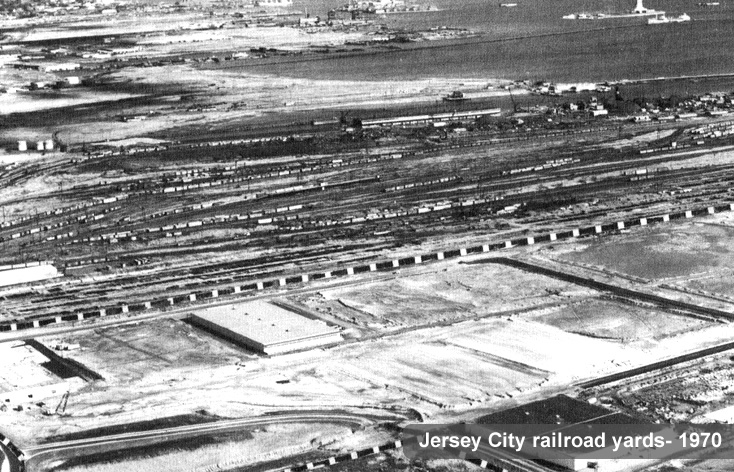 The vast railroad yards were slowly abandoned and the shoreline fell into disarray. 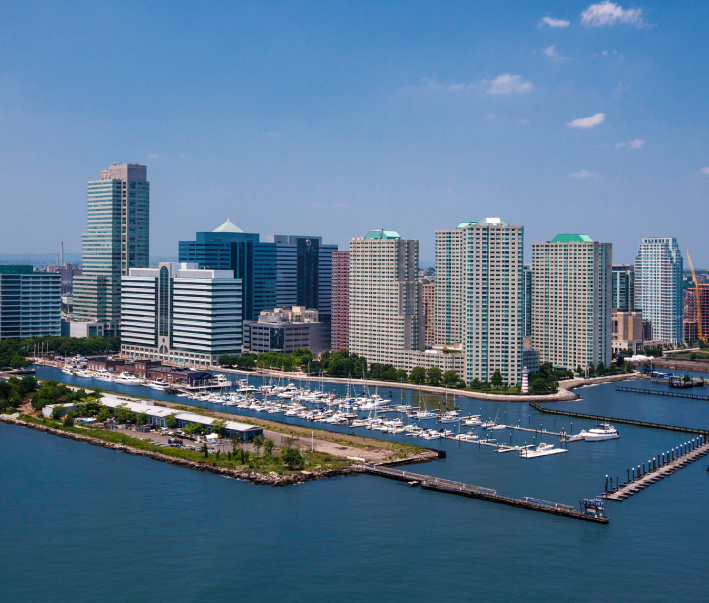 Redevelopment of the area began in 1986 as a $10 billion project led by real-estate tycoon Samuel J. LeFrak and his firm The LeFrak Organization. 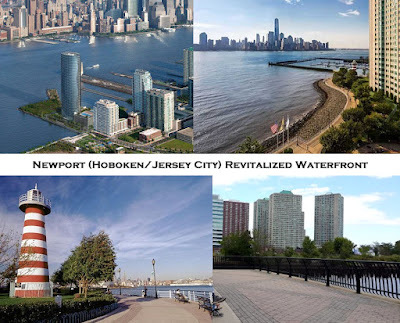 With its close proximity to Manhattan, great transportation links, lower real estate costs and numerous tax breaks--Newport was born on the ashes of the former railroad yards. But the walk along the riverfront, despite its somewhat overtly clean-cut Disneyland ambiance, still reveals the area’s grimy industrial past--a lingering testament to the powerful role the docks and the railroads had in the economic growth of the region.